Manusmrti is a treatise on Dharma. It is the first Law book of its type in the world. As the word 'Law' was defined as 'common sense codified' so can Dharma be defined as "commonly accepted and practised norms of social conduct". Smrtis deal with only this aspect of Dharma. Even though Manusmrti deals with all the four Purusarthas besides the process of creation etc., yet the main object of Manu is centred around the smooth running of social life leaving little room for social unrest. Manu seems to be of opinion that even Moksa is possible only in a calm and peaceful society what to talk of the secular advancement. Among innumerable characteristic aspects of Dharma, only Upasana and Acara-the two are of social importance and, the rest are only indirectly related to society. This is why, by Dharma Sastra, we mean only Smrtis supported by and based on the Vedas. The Vedas, the Vedic Smrtis, the qualities of the knowers of Vedas, the conduct of pious ones and lastly the self- satisfaction-these are the sources from which Dharma emanates. As a matter of fact this verse may be taken as an explanatory note of the word 'sheel' appearing in (Manusmrti II. 6). As is quite apparent, these 10 are not Dharma in themselves but are distinguishing features or characteristic marks of a religious person. In any organised religion such as Hindu, Moslim etc., there are certain rules and norms which are to be followed by all without exception. Then above and apart from these, certain individuals according to their talent and capability undergo special disciplining. We may term it as general and individual discipline. It is just like sub-sects within the frame work of a cult or creed. Basically all humans of the world are one and the same. Their body, mind and thinking pattern-all are alike. Dividing factors are- (1) Colour (2) Country (3) Language and (4) The Religion. But for these every human is a human just as every cow is a cow and every animal is an animal. To try to hold this unity, is the biggest Dharma the universal Dharma. Then again just like every man is a man and animal is animal, similarly every living being is a life and as such, at the end of our vertical journey we find an absolute oneness at the root of this apparent diversity. And Dharma will cease to be Dharma if it fails to teach how to realize this ultimate unit which unites the whole universe and even beyond it. Manusmrti is as a matter of truth not only Dharma Sastra but Purusartha Sastra as it deals with Arth, Kama and Moksa also. But since it regards Dharma as a stepping stone for realizing the other three and with the result it discusses Dharma in a greater detail it is called and in fact it is, Dharma Sastra. As such, it prescribes ways for earning money strictly through right means; for utilizing money in a rightful manner and enjoying married life and procreating progeny and finally attaining Moksa. Is Manusmrti only a Hindu Sastra? No, it covers a universal range and arena as mostly it deals with the human nature, human relations, human needs and human requirements. It recognizes human shortcomings with the utmost sympathy. Manu and Gita both recognize the fact what is natural cannot be wrong eventhough curbing or subduing or sublimating natural instincts may be beneficiary and it is not altogether impossible. More often than not such verdicts of universal nature, we find in Manusmrti. In connection with selecting a bride or a groom, what Manu says, is not just Hindu ways. Of course the religious sacraments given by Manu are different from those adopted by other creeds. In that way Manusmrti can be termed as Hindu Dharma Sastra. Who was Manu who composed Manusmrti as it is available in its present form? Was it the same Manu-the first progeny of the creator? Present Manusmrti says-Yes, it was the same Manu. Brahma created Manu and then taught him this Dharma. It will mean that Manusmrti came into existence billions of billions of years before. Manu also says-Brahma taught me and I on my part taught the same to Marici and Bhrgu etc., and present Manusmrti is taught to other Rsis by Bhrgu and not by Manu himself. Even though Manu as a personage, was prehistoric according to the present conception of the term, yet he was and still is a historic person and the beginner of the human History. Either in 'Manav' or 'Manushy' or Man, it is Manu who is present in an eternal and immortal way. But the Manusmrti in its present linguistic form and structure, is decidedly a very modern work. The language used in it, is certainly the post Panini language. Whosoever composed the present Manusmrti cannot be older than Christ. In my opinion the time of composing should not go before 5th or 6th century A.D. 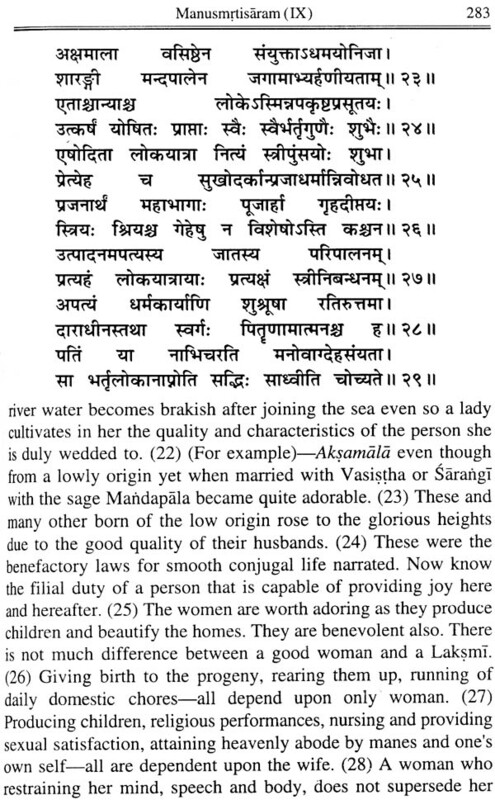 So far as mention of Manu by Sudraka in his Mrcchakatikam as- "Ayam hi Pataki vipro n vadhyo manurbraveet"is concerned; it certainly does not mean that Manusmrti in its present form was in existence in that period. It simply means that teachings of Manu were taken as command with due respect and esteem. Prof. P.V. Kane regards this book older than the 2nd century A.D. As a matter of truth it may be even timeless but the present form of it, particularly the language, the social behaviours, the legal norms- civil and criminal-the references of different types of religious organizations etc., cannot be timeless. Rather they can be traced out to be more modern. However, it may be taken that Manusmrti was authored by Manu-Swayambhuva Manu. It was taught to the Rsis from one generation to the other. And every generation or every second generation must have made, some prunning, some alternate arrangements, some amendments, some additions. The language of expression also must have changed from age to age.